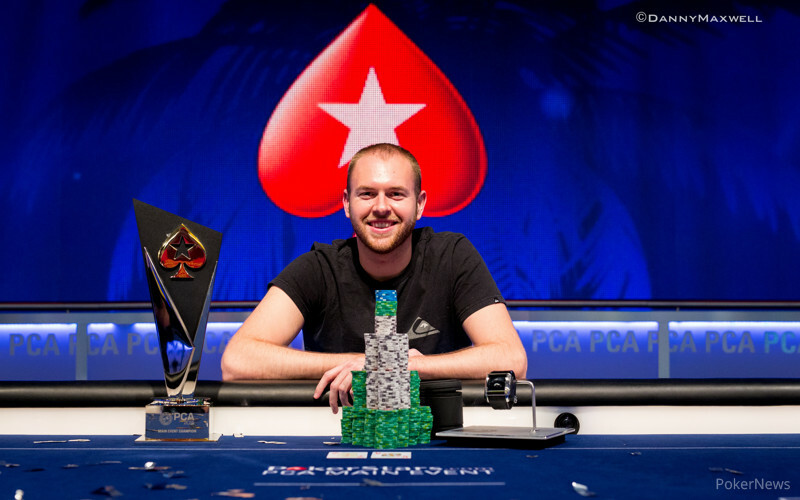 Kevin Schulz Wins 2015 PokerStars Caribbean Adventure Main Event for$1,491,580! Last year at the PokerStars Caribbean Adventure Main Event it took 16 hours for a winner to be determined. 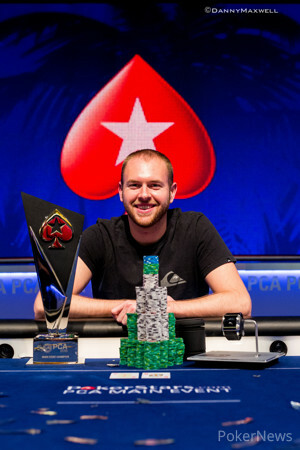 In the 2015 version, the final day was done in under six hours and it was American Kevin Schulz who came out on top winning the prestigious title and $1,491,580. Schulz, whose best live cash prior to this tournament was a fourth place finish in a World Series of Poker event in 2012 for $267,792, defeated Peru's Diego Ventura heads up when he made a brilliant call on the final hand. Ventura had check-raised all in on the river with the board showing with and after thinking it through for several minutes, Schulz made a quiet call with . His friends, including his poker mentor Faraz Jaka, mobbed him as they celebrated his accomplishment. The day began with six players and it only took five hands for the first elimination to occur. Rami Boukai came in as a short stack and moved all in for a little more than 11 big blinds with . Niklas Hambitzer called with and delivered the knockout blow when the board ran out for a pair of aces. Things went back and forth between the remaining five for a bit as the chip lead swapped hands several times between Hambitzer, Schulz, and start of day chip leader Chance Kornuth. Juan Martin Pastor picked up Big Slick at the wrong time as he ran into the of Kevin Schulz. After opening for 230,000 with , Pastor moved all in for his last 1,700,000 after Schulz three-bet. Pastor hit a king on the flop but that was all the help he would get and he'd be eliminated in fifth place. Ventura patiently picked his spots throughout the final table and secured a crucial double up against Chance Kornuth midway through play. With a flop of , Kornuth checked with and Ventura bet 230,000 with . Kornuth check-raised to 490,000 and Ventura shoved all in with his pair of queens, ten kicker. Kornuth immediately called and received a few more outs to eliminate Ventura when the turn was the . The river did not bring any of those outs, however, as it was the and Ventura was well on his way to making a much deeper run. The chip lead continued to change hands with Kornuth retaking it at one point before Schulz started to pull away from the pack, mostly by chipping away and picking up several medium sized pots off of Kornuth. Hambitzer and Kornuth would tangle in a key hand that saw Kornuth move all in with and get called by Hambitzer's . The flop had Kornuth in bad shape as it gave Hambitzer a pair of kings. Kornuth did hit a pair of sevens and it was a third seven on the river that kept him alive and crippled Hambitzer while doing so. Hambitzer's bad luck continued and he was eliminated in fourth place when he four-bet shove his last 1,285,000 with and was called by Schulz who held . A nine on the flop and another on the turn had the German drawing dead when another nine hit. Kornuth never seemed to have things go his way and he was eliminated in third place when he moved all in with and the big stack of Schulz called with . He looked as if he was going to secure a double up when the flop came . Schulz picked up an inside straight draw on the turn and hit that draw when the was delivered on the river. To his credit, Kornuth left with a smile on his face. Heads up play saw Schulz start with a commanding chip lead of nearly four-to-one entering heads up play but Ventura doubled up by winning a race with against Schulz's . Schulz continued to apply pressure though until the final hand and the great call he made that delivered him the title. Congratulations to Schulz who earned $1,491,580, the trophy, a SLYDE watch, and a prominent place in poker's history books. Season 11 of the EPT continues in less than two weeks with EPT Deauville, and PokerNews will be on hand to provide live updates. Thank you for following our coverage of the 2015 PCA! Hand #141: Kevin Schulz raised to 350,000 with from the button and Diego Ventura three-bet to 1,100,000 with and Schulz folded. Hand #142: Schulz received a walk. Hand #143: Schulz completed from the button with and Ventura checked his option with . The flop came and Ventura check-called a 365,000 bet from Schulz. The turn was the and Ventura checked to Schulz who bet 775,000. Ventura called. The river was the and Ventura checked to Schulz who made it 900,000 to go. Ventura moved all in for 3,105,000 total. Schulz took two sips of his water and asked the dealer how much more it was. He spent another minute before quietly announcing a call. Ventura stood, knowing his four was probably no good and those fears were confirmed when Schulz tabled his hand. Schulz's rail mobbed him after making the great call that resulted in him becoming the winner of the 2015 PCA Main Event. Diego Ventura was eliminated in second place, a great finish for the young Peruvian. Hand #133: Kevin Schulz raised the button with , and Diego Ventura called with . Ventura check-folded an flop. Hand #134: This hand wasn't broadcast. Hand #135: Schulz opened the button with and won the pot. Hand #136: This hand wasn't broadcast. Hand #137: A flop prompted Ventura to check-called 425,000 from Schulz with . Schulz had top pair with . Ventura grabbed the betting lead with 750,000 on the . The river gave Schulz trips, and Ventura checked. Schulz went with a really small bet of 525,000. Ventura found a fold. Hand #138: Schulz got a walk. Hand #139: Schulz opened to 350,000, but Ventura had and folded. Hand #140: Ventura picked up the this time and he decided to just call. Schulz checked with a dominated . Two checks on the , and a hit. More checks, and two more on the , so Ventura won the minimum pot. Hand #126: Diego Ventura completed his small blind with and Kevin Schulz checked his option with . The flop came and both players checked. The turn was the and Schulz check-folded to a 175,000 bet from Ventura. Hand #127: Schulz opened to 350,000 with and Ventura called with . The flop cmae to give Schulz two pair and Ventura an open-ended straight draw and a small flush draw. Ventura checked, Schulz bet 550,000 and Ventura folded. Hand #128: This hand was not broadcast. Hand #129: Schulz and Ventura saw a raised flop of with Schulz holding and Ventura . The turn was the and Ventura check-called a 360,000 bet from Schulz. The river was the and Ventura checked again and Schulz bet 750,000 holding two pair. Ventura folded. Hand #130: Ventura raised with and Schulz folded his big blind. Hand #131: Ventura received a walk in his big blind. Hand #132: Schulz raised to 560,000 from the big blind with after Ventura completed with . Ventura called. The flop was and both players checked. The turn was the and it again went check-check. The river was the and Schulz led out this time for 450,000 and Ventura folded. Hand #117: Kevin Schulz made it 400,000 to go with , and Diego Ventura three-bet to 800,000 with . Schulz jammed, and Ventura snapped in. Ventura grabbed his nation's flag, and he was the one loving the flop. Running hit the board, doubling Ventura. Hand #118: Ventura called with and folded to a raise from Schulz with . Hand #119: Schulz raised the button with and folded out . Hand #120: Ventura raised from the small blind and won. Hand #121: Schulz opened and won the pot. Hand #122: Ventura limped , and Schulz checked . On the flop, Ventura checked back, and the improved both players to draws. Schulz check-called 250,000 and then gave up the pot on the river as both checked. Hand #123: Schulz raised with and took it down. Hand #124: This hand wasn't broadcast. Hand #125: Schulz opened for 350,000 with , and Ventura defended . He checked the flop, and Schulz won with a bet. Hand #111: Diego Ventura raised to 375,000 with and Kevin Schulz called with . The flop came and Schulz checked to Ventura bet 290,000. Schulz check-raised and Ventura quickly folded. Hand #112: Schulz raised and Ventura folded his big blind. Hand #113: Ventura raised to 375,000 with and Schulz three-bet to 1,000,000 with . Ventura made the call. The flop came to give Schulz a pair of aces and Ventura a gutshot straight draw. Schulz led out for 935,000. Ventura called. THe turn was the to give Schulz a flush draw to go with his pair of aces. Schulz moved all in and Ventura folded, but not before tanking and Hollywooding for several minutes. Hand #114: Schulz opened to 400,000 with and Ventura moved all in for 3,590,000 with . Schulz quickly folded. Hand #115: Ventura completed with and Schulz checked his option with . The flop came and Schulz bet 250,000 which Ventura raised to 700,000. Schulz folded. Hand #116: Schulz opened to 400,000 with and Ventura three-bet to 1,200,000 with . Schulz moved all in and Ventura snap-called. The flop came and Ventura celebrated nervously with his rail. The turn was the and the river was the and Ventura doubled up to 8,900,000. Hand #106: Kevin Schulz raised with and Diego Ventura folded . Hand #107: Ventura called with , and Schulz checked . Ventura checked back, and a hit. Ventura bet this time when checked to, and his 175,000 was called. The kept Ventura ahead, and he won a checked showdown. Hand #108 This hand wasn't broadcast. Hand #109: Schulz bet 250,000 on the flop with , and Ventura called with . Both checked the , and the led to a check from Schulz. He folded to a river bet. Hand #110: Schulz raised to 400,000 with and was called by Ventura with . The flop favored Ventura, and he check-called 260,000. The appeared on the turn and prompted two checks. A river caused another check from Ventura and Schulz fired 325,000. Ventura took a bit of time and called, winning the pot.